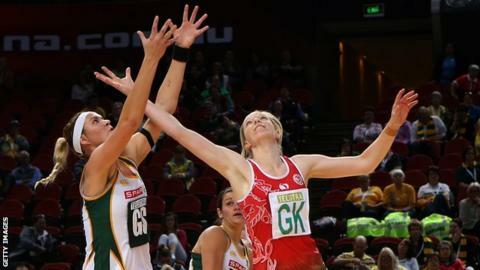 Wales lost for the first time at the Netball World Cup as South Africa proved too strong in a 68-40 victory in Sydney. In the first game of the second group stage, Wales were in touch at half-time as they trailed 31-21 to the team ranked fifth in the world. But a dominant third quarter by South Africa, scoring 24 goals to Wales' eight, settled the match as a contest. "South Africa were the better side," said Wales coach Trish Wilcox. "But I'm disappointed we let ourselves down in the third quarter, which then enabled the score to blow out. "But certainly the work the girls have been doing in the first stages, they sustained that for three quarters of the game so there are definitely positives to take out of it." Wales qualified for the top-eight stage of the tournament by beating Fiji,Zambia and Uganda. They will now face England on Wednesday before playing hosts Australia on Friday. The top two sides in the group will progress to the semi-finals, where they will meet the top two sides from the other group containing New Zealand, Malawi, Uganda and Jamaica.